GenreOnline.net: "AVP: Alien vs. Predator" Maze Hits Universal Studios for Halloween Horror Nights! "AVP: Alien vs. Predator" Maze Hits Universal Studios for Halloween Horror Nights! ORLANDO, Fla., UNIVERSAL CITY, Ca., (August 5, 2014) — In collaboration with Twentieth Century Fox Consumer Products,Universal Orlando Resort and Universal Studios Hollywood are putting “Halloween Horror Nights’” guests in the middle of an epic and primal war between the universe’s most deadly species in an all-new, horrifying maze inspired by the cult sci-fi franchiseAVP: Alien vs. Predator, beginning Friday, September 19, 2014. AVP: Alien vs. Predator is a sci-fi horror franchise that brings together the two iconic species spawned from two blockbuster films,Alien and Predator, to create a terrifying crossover of eponymous monsters in a raging battle against mankind struggling to survive amid the chaos that ensues from these two vengeful creatures. To mark the 35th anniversary celebration of Alien, and the 10th anniversary of AVP: Alien vs. Predator, “Halloween Horror Nights” guests and fans of these celebrated films will have a chance to live the horror of these diabolical beasts as they come face to face with the terror of Aliens and Predators. 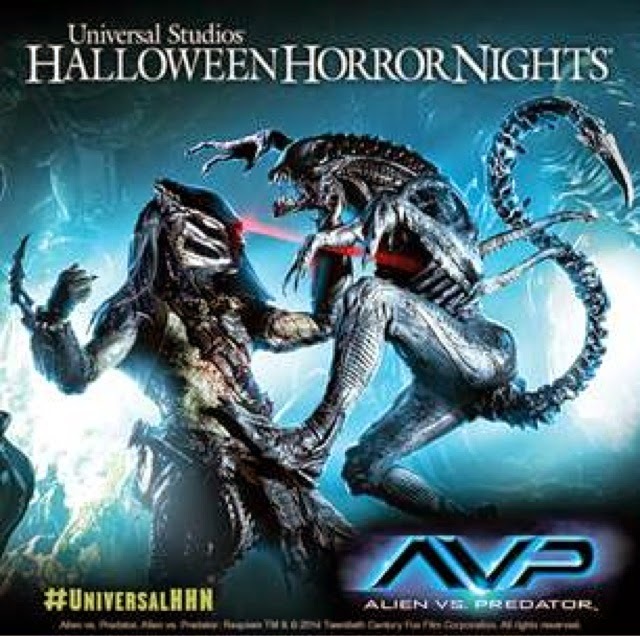 To learn more about this all-new “Halloween Horror Nights” maze, click here: "AVP: Alien vs. Predator." Vacation like you mean it at Universal Orlando Resort – where every heart pounding, jaw-dropping, goose-bumping second counts. It is the only place where you can turn spending time with your family into spending time as a family. Together, you can soar above Hogwarts with Harry Potter, swing above the streets with Spider-Man, become a Minion in the hilarious and heartwarming Despicable Me Minion Mayhem ride, and join Optimus Prime in the fight to save mankind on the new mega-attraction, TRANSFORMERS: The Ride – 3D. And now open, you can step into The Wizarding World of Harry Potter – Diagon Alley. Universal Orlando Resort is home to two incredible theme parks: Universal Studios Florida and Universal’s Islands of Adventure; four magnificently themed on-site hotels: Loews Portofino Bay Hotel, Hard Rock Hotel, Loews Royal Pacific Resort and the newest addition, Universal’s Cabana Bay Beach Resort; and Universal CityWalk - a unique dining and entertainment complex featuring one-of-a-kind restaurants, shops and nightclubs. And located just minutes from Universal Orlando Resort is Wet n’ Wild, Orlando’s premier waterpark. Tickets and vacation packages for Halloween Horror Nights at Universal Orlando are on sale now atHalloweenHorrorNights.com\Orlando. More information about the event will be available soon. Updates on Universal Orlando’s Halloween Horror Nights are available on Facebook at Halloween Horror Nights – Universal Orlando and on Instagram at@HorrorNightsORL. Plus, fans can get exclusive updates from Creative Development Director Mike Aiello on Twitter at @HorrorNightsORL.